A main activity of the GEOSS S&T Stakeholder Network is to provide a link between S&T communities and GEO and to promote GEOSS in S&T communities. The longterm vision is a GEOSS aligned to big challenges and major societal goals. To a large extent these goals are reached by organzing GEOSS S&T Stakeholder Workshops that focus on the societal benefits of Earth observations and facilitate a prioritization of Earth observation based on the information needs to achieve societal goals and targets. The GSTSN originated in the EC-funded EGIDA Project. The EGIDA Stakeholder Network initially included the members listed here. A more complete picture of the GEOSS S&T Stakeholders is given here. 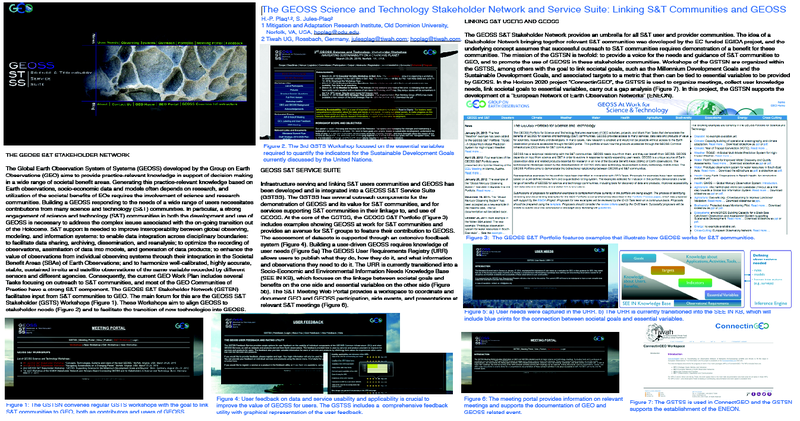 The activities of the GEOSS S&T Stakeholder Network derive from the S&T Road Map. A map of S&T Road Map activities and relevant stakeholder groups is available here.